I don't have SAD, but I do have a problem staying awake during the day. It's something to do with the quality of the sleep I get at night, but I don't have a definitive answer yet as to what could be causing it. However, it is a big problem, when you spend a lot of the day sitting at a computer trying to type coherent sentences, without resorting to piles of chocolate and tea to get through it. Ok, I might still consume copious amounts of chocolate and tea anyway, but it would be nice to be able to stay awake and enjoy it. 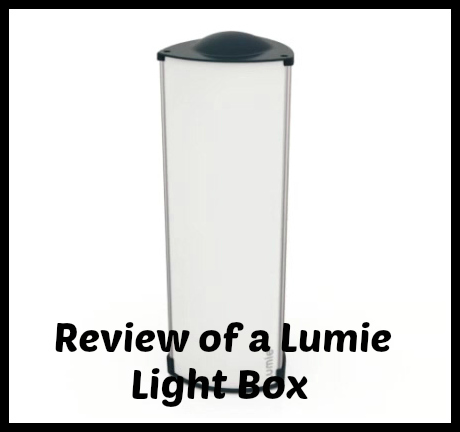 Lumie produce a variety of different lightboxes, as well as bodyclock wake-up lights and skin therapy lamps. 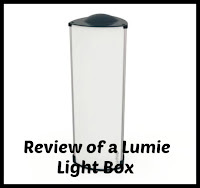 They sent me the Brightspark Lightbox free of charge, for the purposes of this honest review. 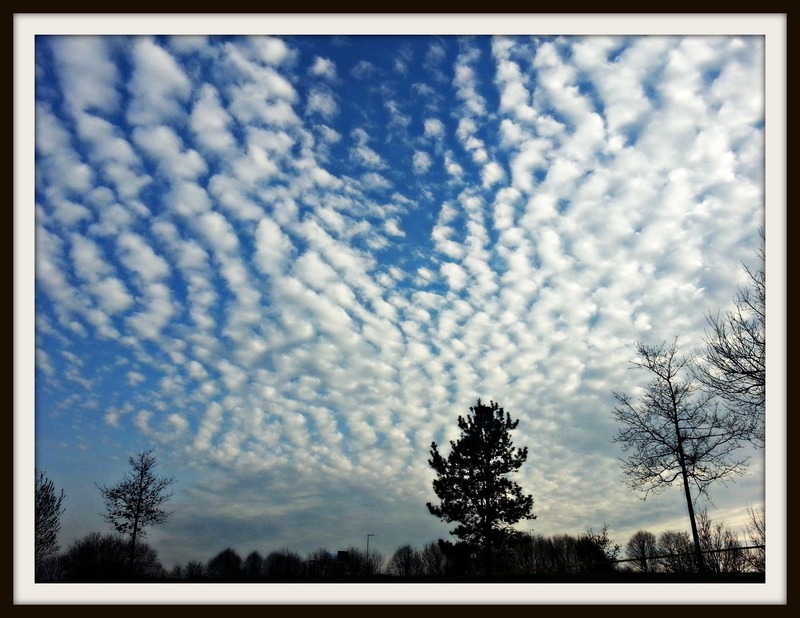 Blue sky and fluffy clouds, which I am very glad to see after the very long winter months we've just had. When Autumn comes, the sun disappear and the house becomes very dark. I find myself switching the lights on during the day, just to remind myself it's not bedtime yet! So, I was really intrigued to find out if a lightbox would make a difference. I had been interested in them for years, but I had assumed that; 1. They would be huge and intrusive in a small space and 2. They would be really expensive. Whilst £115 isn't cheap, it's a good investment for what it can achieve. 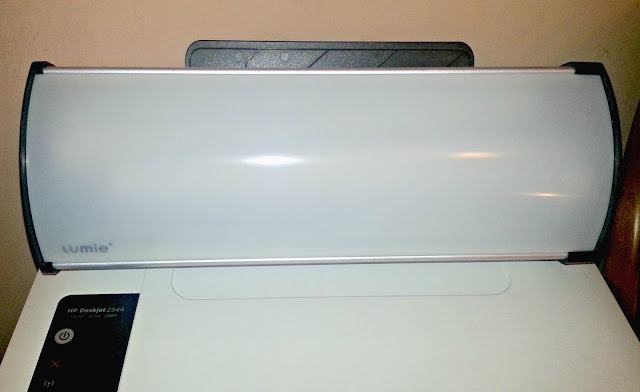 Lightboxes are used for a variety of different reasons and, as well as treating the symptoms of SAD with summer levels of bright light, they have also been shown to lift mood, boost concentration and restore natural energy, proving useful in a variety of different situations, such as boring work days and even sports training. 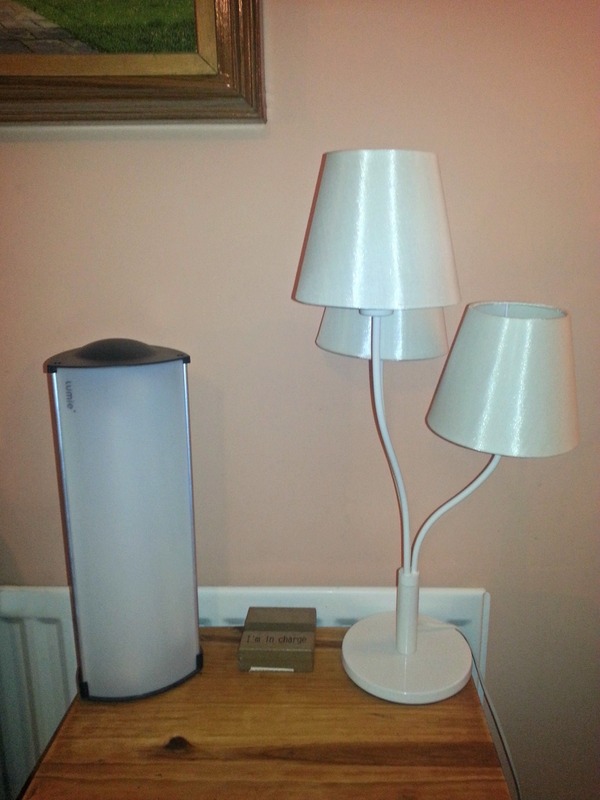 They are also particularly useful for night workers, like my husband. He has worked nights for over twenty years and can go a whole week without seeing daylight. It's not too bad in the summer, but during the winter months when the days are so much shorter, he exists in a twighlight world. On the rare occasion he awakes in daylight the effect is best described as 'confused bushbaby', as his eyes adjust to the unnaturally bright light. This can't be good for him, as sunlight isn't just good for our concentration and wakefulness, it also goes a long way to lifting the human spirit. We've all experienced bad days that have been vastly improved by the sun making a welcome appearance and feeling like it's warming our very souls. So I've been subjecting him to regular light therapy sessions too. Once he got used to the feeling of being interrogated; 'Nobody saw me do it, you can't prove anything! ', he barely noticed the light at all and actually said he liked the brightness, as our house is usually pretty dimly lit and it was nice to be properly illuminated! I must admit, an unforeseen benefit of the lightbox has definitely been the effect on the room. It's lovely to have light that reaches all the corners, and I've even been using it to light my Youtube videos too, as it is so much more natural-looking than standard light. But did it work? The short answer is; yes. I noticed a difference in my energy levels and concentration when I used it for an hour in the morning each day. The best bit though, was that it gave a similar warm, bright feeling as you would get from natural sunlight, which lifted my mood in the same way that a lovely sunny day would. I have seen so many benefits to having the lamp, that I would definitely recommend it. I think we can all use the benefits of the lightbox, even without having SAD. You can't put a price on lifting your spirits when the grey days seem endless and summer seems a long way off. It's also brilliant for illuminating the dimmest rooms and shedding some much needed light in those dark corners. It's really powerful, particularly considering its size and the design allows it to emit the maximum light, due to its fan-like shape. It doesn't seem to weigh much at all and the integral handle makes it very portable. It sits happily on a side table and doesn't look at all out of place. It works equally well upright or on its side, giving it maximum versatility. Overall, I think it's the perfect addition to the home or workplace and would fit in pretty much anywhere.